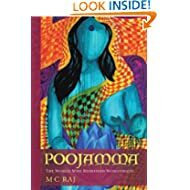 Do yourself a favor and take a trip to modern-day India by reading M C Raj’s fifth novel, Poojamma, The Woman Who Redefined Womanhood. Submerge in the mysterious culture of this fascinating country, and soak up the colors and layers of the human condition: not an easy journey, but very rewarding. M C Raj is a master tour-guide. Poojamma, the title character, is a shooting star of humanity, who lives among the Dalit people (Untouchables) in rural Karnataka. She devotes her life to the education and empowerment of the poor in a confusing era in India’s history, when traditional beliefs and practices clash with the demandingly fast global development, and political corruption is rampant: “No political party in India is interested to develop the people. They only want to create the grand illusion that they are developing the country” (p. 18). Poojamma gains unsurpassed popularity among the villagers, and venomous enemies among the rulers who are trying to hold on to the people’s religious and traditional ways in order to continue exploiting the poor, thus secure their own wealth and power, even if it means disregarding The Constitution of India. The story begins with the funeral of Poojamma and unfolds in a series of flashbacks in a prolonged conversation between beautiful and empowered Kala, Pojamma’s young disciple, and Nina, an American journalist. Providing this frame to the main plot is an ingenious strategy on the author’s part. Nina becomes the liaison and cultural interpreter for us less informed Western readers: we see the events narrated by Kala through Nina’s American eyes, and her – at times naïve – questions makes us less embarrassed about our ignorance. Thank you, M C Raj! Under the egis of fictional Poojamma’s tumultuous and meaningful life story, M C Raj gives a comprehensive picture of modern Indian society from a Dalit point of view. A person of Dalit heritage himself, he reveals and discusses many important and controversial issues in India today, including the effects of the traditional caste system and its “bloody customs” (p. 22) on individual families and people, the prevalent oppression of the less fortunate (the distortion of the original 1952 government land deal with the Dalits, p. 198), the eye-opening rural conditions, corruption, and the treatment of women. His style is conversational yet authoritative whether he talks about the Thailand “sexapades” of local Indian politicians or the despicable custom of casting new mothers out of a village and forcing them to live in a tiny, inhumane hut in order to avoid a village’s contamination by blood. The author’s respect and love for women is obvious. All major and most minor progressive characters are enlightened, strong, and empowered women in a world where women still do not have an equal place. The book is fascinating. The narration, even though the novel is set in modern-day India, has a mythical quality. M C Raj’s language is a spicy mixture of fire, unexpected visuals, and deliciously foreign idioms blended with crude slang and occasional faux pas. His figures of speech carry the flavor of exotic India. Poetic interludes mingle with rapid action, and the characters use graceful imagery and curse words in the same paragraph. I like it; it transports me to a foreign land, where people speak with an accent, and where logic, aesthetics, and the ways of storytelling are different than mine. On the other hand, it might be a challenge for action oriented readers who are used to a linear, Hollywood-style plot. The storyline is complicated and fragmented by flashbacks (within flashbacks), and the reading becomes labored after a while because of the overwhelming factual and sensory details. Yet, I could not put it down. Open-minded readers will experience an exhilarating journey with the expert guidance of prolific and well-respected writer of India, M C Raj. Those with some background knowledge in Indian history, politics, and law will be thrilled, but no one should miss the tour.